It’s been quite a while since I have written on here and I do have to say, I have missed it. It’s a goal to get this going again and I can tell you there are some fun changes happening soon… but it’s a little hush, but be patient. It’s been a busy summer. As most of the church is winding down, student ministry is revving up. We just got back from summer camp and it was incredible. Summer camp is such a pivotal part of our ministry. We use it as a catalyst to launch small groups and create momentum in the fall. I believe summer camp should be one of the most important things we think about but not only the camp itself, but what happens after the camp. How do you capitalize on what you just saw God do in the lives of your students to continue to help them in their spiritual growth? I think one of the most important things is what happens after camp. We tell them all of the time that we want to help them take their next steps in their faith but many pastors do not have a plan to actually help them do so. This year, we wanted to be intentional about it. We wanted to make something super simple but super clear when it comes to helping students know what their next steps are so we made little business cards with 3 potential next steps. Are there more than three next steps, 100%, but for the most part, we thought these three things would get most of the crowd thinking through their next steps. If anything, we wanted to let them know we find this really important, important enough to make fancy cards (we use uprinting.com BTW) to tell them about it. Each of these things is aimed at different levels of spiritual development for students. 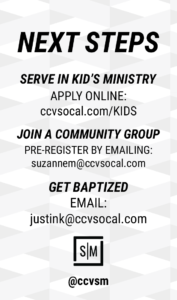 Serving in kids – This would be for students who have been around for a while, who are more “core” kids and are not serving anywhere yet. We also push kids to be weekend greeters if they cannot commit to leading weekly in kids. If we say we really do want our students to take their next steps we need to make sure we are providing a clear pathway for them to do so. We can’t let laziness or unintentionality get in the way of the growth of our students. For you, how do you help your students with their next steps?